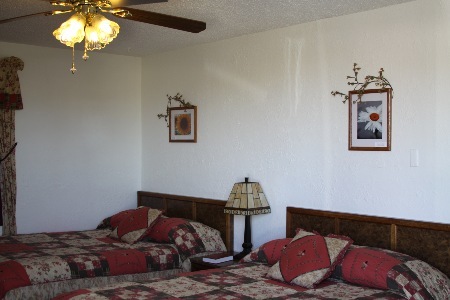 We strive to offer you a unique, clean and cozy room. We know you can take a room anywhere, and most of those rooms will be very much alike. Our goal is to offer you a room your Grandma would be proud of, complete with details down to feather pillows and linen napkins! We consider each of our guests as friends/family and seek to spoil you the way we would like to be spoiled ourselves. We are daily in our rooms primping and detailing them, keeping them clean enough to pass Mom's inspection! We are also open to any suggestions you may have on how we could improve your next stay with us. A safe and secure stay both in your room and on the property. Over 90 channels on Satalite T.V. Refrigerators, microwaves, coffee pots with tea and coffee in each room. Both paper and china cups for your beverages. Warm Heaters and Cool Air Conditioners. Car to door entry with storm and regular doors. Comfortable mattresses, clean, comfortable bedding including feather pillows! (Synthetic pillows are available upon request). 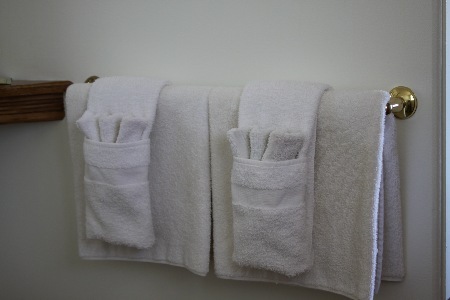 Along with plentiful bath linens we provide shampoo, soap and lotion, all made with organic ingredients. Postal and fax services at office. Errand services for those who are staying here with a tight schedule. All natural, organic cleaning products are used to maintain our rooms for those who are sensitive. Ice in office, soda machine on-site. Outdoor gazebo with flower garden for dinning or visiting. Available at the office for your use: iron/ironing boards, alarm clocks, radios, board games, ice, extra blankets, pillows, etc. in other words; if you are in need, we probably have it on hand for you.